When we first moved into our apartment in San Francisco, Chris, Brian and I would gather on the couch every Wednesday to watch our favourite collective guilty pleasure, “Miami Ink.” Before the drama with Kat Von D, it was a decent drama-less reality show. Liam abhorred the owner of the tattoo parlour, Ami, who seemed to constantly be drawing mediocre koi fish. 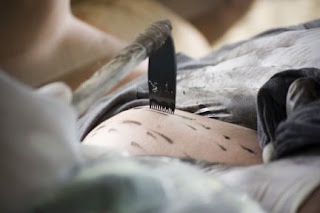 On one episode, Ami and another artist travelled to Hawai’i to get a tattoo the traditional way; i.e. with a shark’s tooth filled with ink and a little hammer. In Samoa, the practice of traditional tattoos is alive and well. For most artists, the shark’s tooth is a thing of the past, replaced by a pointy piece of steel that is more hygienic. The art itself, however, has not changed, and remains a source of cultural pride for Samoa. Traditional armbands, wristbands, and legbands are extremely common. They can be seen on teachers and students at my school, old ladies at church, young guys walking down the street, the mean lady that runs the internet café. I’m not clear on whether there’s any particular status that goes a long with a particular tattoo. There may have been, but that seems to be a thing of the past—particularly with the more minor tattoos. The full body tattoos are the ones that command a higher level of respect. For men, the full body tattoo is called sogai’miti. Though it is not the full body of black that the Japanese mafia is known for, it is goes from just below the knee all the way up the chest and shoulder blades. From what I hear, the sogai’miti is quite an ordeal to get and takes no less than a week under the tooth, longer if your threshold of pain is lower. Traditionally, men get it done in pairs as a means of “spotting” each other; it makes a guy less likely to quit if is friend is going through it. I’ve heard that the knees are the worst part, which makes sense; hammering a shark’s tooth into your knee sounds like the world’s worst Charlie horse. That said, I’ve also heard that they have to hold your cheeks apart while they ink your bum. Maybe you didn’t want to know that. But I told you anyway. The traditional woman’s body tattoo seems slightly less intense. The designs are sparser with ink, but still involve inking quite a bit of the body. 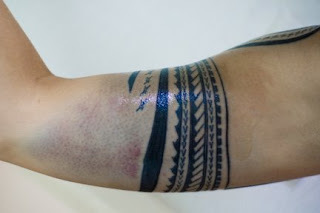 While tattoos are a cultural phenomenon across Polynesia, specific designs are unique to particular islands and specific cultures. The Samoan tattoo designs are a huge cultural influence and show up in many other places like on lavalavas and even on the designs painted on the walls of my computer lab. A few weeks back I was at dinner with Cale and Sara and the guy at the table next to us saw Sara’s tattoo and said, “That tattoo is Samoan. No matter where else you go in the world, no one else makes tattoos like that. That is a Samoan design.” The guy was beaming. As I said, it’s definitely a source of cultural pride. As far as Peace Corps volunteers getting tattoos goes, it’s fairly popular. Phil and I discovered that playing the “Who’s Going to Get a Tattoo First?” game is nearly as enjoyable as the higher stakes, more pessimistic “Who’s Going to Go Home First?” game. The Medical Officer pointed out that volunteers tend to get the tattoo itch right around the one-year mark. Sara and Erik were right on the mark there. Dylan waited until the very end of his service. Several members of group 80 jumped the gun and got their tattoos right out of training. No tattoo activity yet for ole group 81. But I’ll let you know if I hear anything. Tomorrow we go back to the regularly scheduled Odds and Ends and then back to blogging as usual on Friday. I hope you enjoyed quarterly Cultural Exploration week. We’ll do it again in July. Hope you’re well. Tattoo pics below. Note: I have shamelessly stolen 2 pictures below from Sara's post from when she actually got a tattoo. Her post is more comprehensive than the crap I wrote above, and far better researched. I highly suggest you check it out. It's the real deal. The man in the picture above the fold has has the full body tattoo. And the guy in this picture is getting his. Look how happy he looks. This is the thigh part of the traditional female tattoo. Shamelessly taken from Sara. This is her arm. Also shamelessly taken from Sara. That's the shark-tooth comb thing. Have you picked out our matching tattoos yet?? "I’ve also heard that they have to hold your cheeks apart while they ink your bum." It's a beautiful samoan tattoo, steals more photos please.